15th/16thc, Northern Elm or Sophora (Huai), Shanxi. 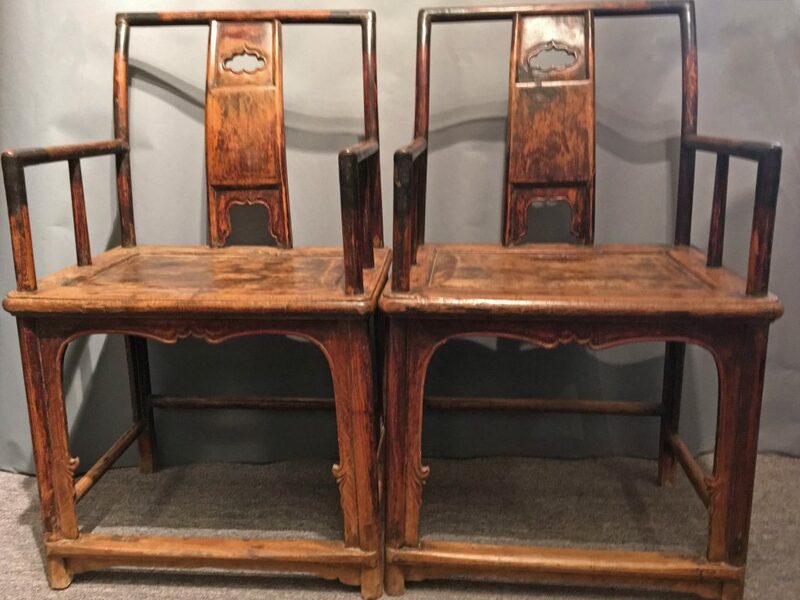 This pair of chairs displays indisputable characteristics of what constitute a Ming chair. Typical of Ming chair is the backward slope of its hind posts and backrest, as well as the rounded contour of its supporting frame member. Ming furniture often is lacquered with fabric underlay covering the entire surface, but here it is restricted to the arm and hind post joints, where strips of fabric, having been soaked in a mixture of thickened lacquer, were pasted over the joints, where movement might otherwise cause cracks to develop. This technique, termed ‘jiachu’, was commonly employed during the Song dynasty. 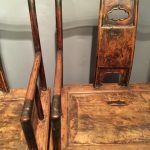 To produce a smooth surface on the wood, coats of lacquer were thinly applied with cotton wadding. Red lacquer was used to highlight the raised beading tracing the ruyi-shaped decorative opening on the top and bottom panels of the frame tri-sectional backrest, as well as on the front and side aprons below the seat. The chair is fitted with a slightly beveled seat panel, which is joined to the seat frame in the traditional mitered, mortise-and -tenon method. The outside edge of the seat frame is convexly molded and beaded. The seat bottom is reinforced with two stretchers whose long tenons penetrate through the seat frame to the surface. The beaded front and side aprons are arched and cusped, with the front apron curving down the inner side of the legs all the way to the foot stretchers as spandrels decorated with hooked flanges. 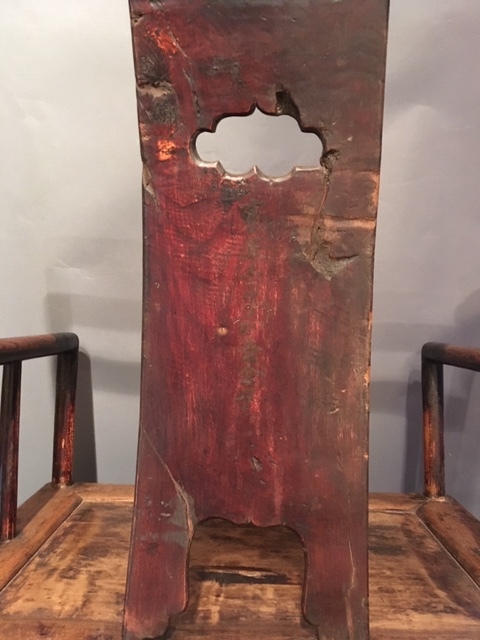 On one of the chairs, a protective iron plate is wrapped around the connection of the armrest to the hind post, and is secured with hand-hammered iron nails. This shows a secure repair to this part. 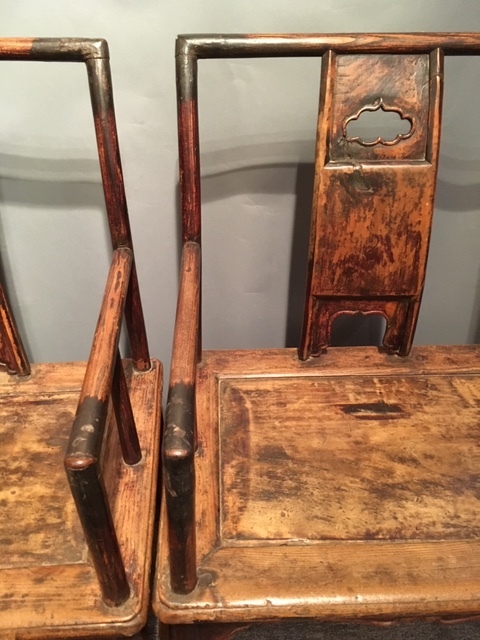 This pair of chairs shows significant age and use but is well restored. The Sophora going into its making shows a reddish glow. 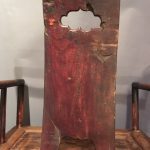 It is important as a study of how a Ming chair of early period was made, and with the many Ming characteristics shown, it is a valuable pair.